FISCO = Fuji International Speedway Co. I'm aware I driven over 25 laps of the circuit IRL now. @Michkov is correct, it's Funabashi! That makes two tracks I've blindly guessed right this week. Well it looks like Interserie from early to mid 1980s. It will be European. Not Hockenheim so obviously not German. First two cars look like a Lola and a Toj. All cars are RHD though...I was thinking more Australia or New Zealand. Interserie never came down here. Yes we had local Sports cars, with Matich, Elfin etc, and McLarens . Pretty sure it is Interserie. Could be Zeltweg, but dont think so. Ill say it though. Too flat for Österreichring. Never having (knowingly) seen a pic from Most, and not knowing whether Interserie ever raced there, I'll try something off-beat. Track seems to be "freshly" build. No armco too. It doesn't look like either Mosport or Mt Tremblant, I think. Not enough greenery. 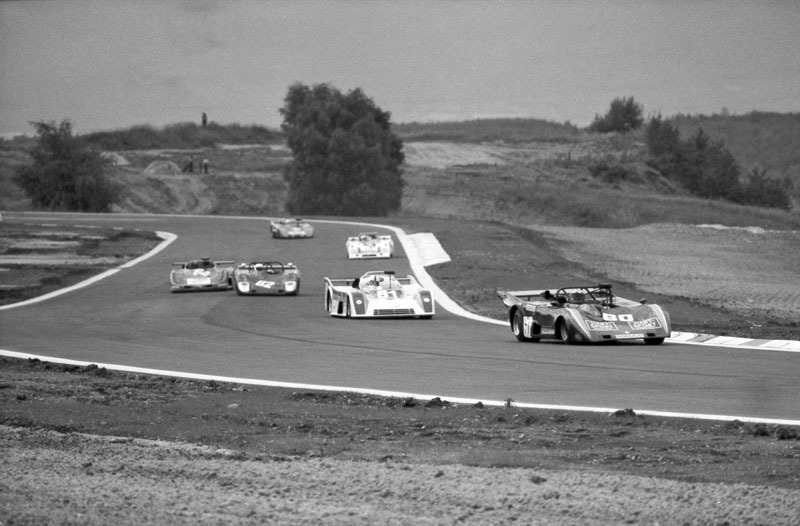 The layout reminds me of a few of the sweepers at the post 1984 Nurburgring, but again, the landscape looks so barren. I'll go with Nurby just to get a guess in. Of course it looks vaguely Czechoslovakian, it's Most after all . @Michael Ferner is it.